Semi Trailer: a freight trailer that when attached is supported at its forward end by the fifth wheel device of the truck tractor. Semi trucks, also known as semi-trailer trucks, tractor-trailer rigs or 18 wheelers, transport over 70 percent of the goods and commodities in the United States. Using a semi truck only became possible with the development of paved roadways in the second decade of the 20th century and later massively expanding with the interstate highway system that we have today. Today’s semi truck is typically an 18-wheeled articulated truck that includes the truck, commonly referred to as the tractor, and the trailer. These tractors consist of three axles with the front axles being used to steer the tractor and the rear axle and the double wheels, or dualies, propel or transfer power for the tractor, this is the drive axle. What was Semi Truck invented for? Alexander Winton, in Cleveland, Ohio invented the semi-truck in 1898 and sold his first manufactured semi-truck in 1899. Winton went into the business of “horseless carriages” in 1896, so today he would be known as a carmaker. The Winton Motor Carriage Company of Cleveland sold their first twenty-two manufactured cars in 1898, and this created the need for the cars to be delivered to their buyers. As the buyers lived all over the country the cars had to be delivered to places hundreds of miles away from Cleveland. This presented a major problem; if the cars were driven to their customers, miles and wear and tear would be placed on the car and also the actual delivery would be expensive. This led him to inventing the concept of the semi-truck to handle the delivery of his manufactured vehicles. He addressed this issue with a new concept that he called an automobile hauler that could carry the new vehicle on a trailer. In 1899, Winton Motor Carriage started manufacturing the hauler for its own use as well as other car manufacturers. The first semi trailer used a modified short-wheeled touring automobile (the tractor) with a cart (the trailer) attached to the rear of it. The platform sat on the top of the engine portion and rested on a pair of wheels on the other end. This may be a bit confusing as most cars and trucks have engines in the front; this car had an engine in the rear. The platform could only hold one automobile. Before the cart was mounted onto the pulling car, the automobile to be delivered was wheeled onto the ramp of the cart and fastened to the platform. The edge of the platform resting on the ground was then elevated and attached to the top of the trunk of the pulling vehicle. Today a flatbed trailer known as an RGN, removable gooseneck, uses the same principle of being driven onto and then hitched to the tractor. Some credit for pursuing the same design idea needs to be given to August Charles Fruehauf, a Detroit blacksmith, who built a carriage for a person who wanted to transport his boat in 1914 and he officially called the carriage a “semi-trailer”. The carriage semi-trailer was attached to a Ford. The semi-trailer was a hit, and he went on to develop the carriage semi-trailer for additional usages such as hauling lumber. In 1918, he incorporated the Fruehauf Trailer Company, which is still a leading maker of semi trailers today. Winton kept his focus on improving engine designs, thus he did not pursue the design of his first semi-truck. However, other industries created a demand for semi trailers and numerous others continued to expand on the semi trailer concept. John C. Endebrock had a lot of background in building horse carriages and used his knowledge to develop what he called the “trailmobile” . The trailmobile was an iron chassis mounted on wheels and springs that could be trailed behind a Ford Model T. This 1918 design was designed so that it would be easy for a single operator to hook the trailer to the car. Earlier trailers required three men to hook up the chassis to the car. Trailmobile is still a brand name today. George Cassens took the vehicle hauling business to the next level in the 1920’s. As a car salesman required to deliver the cars that he sold, he was reliant on car haulers. When in the early 1930’s, he attempted to ship the new cars directly to the buyers; he realized that the shipment costs were prohibitive for the car manufacturers. He stepped in and offered to haul the cars from the manufacturing site to the car owners. He devised a $1,850 four-car auto trailer that was pulled with a two-ton Dodge truck. Mack Trucks was an early innovator of heavy-duty commercial vehicles. Founded in 1900 in Brooklyn, N.Y., the company developed and manufactured its own engines that were equipped with an automatic starter, making the hand-crank obsolete. During the years from 1929 until 1944, Mack produced 2,601 semi or full trailers. Mack soon developed a reputation for building tough trucks and the brand name became known for durability. The logging industry had an effect on the progress and popularity of the semi truck. The truck company Peterbilt, based in Tacoma, Washington, began selling its semi trucks in 1939. Peterbilt trucks were used extensively to haul logs from the forests to the lumber mills. T.A. Peterman found frustrating the standard method of transporting logs by river or horse teams and decided to refurbish surplus Army trucks equipped with trailers specifically made to haul logs. So the various types of semi trailers we see traveling down the highways today is the evolution of a semi trailer designed to haul a single car. Over a hundred years, the two wheel semi trailer from Winton has evolved into an eighteen wheeled semi-truck with three axles. Today, semi trucks transport more than 700,000 tons of goods each year in the United States that are taken to destinations by 3.7 million truck drivers. This represents more than 70 percent of all U.S. freight delivery. 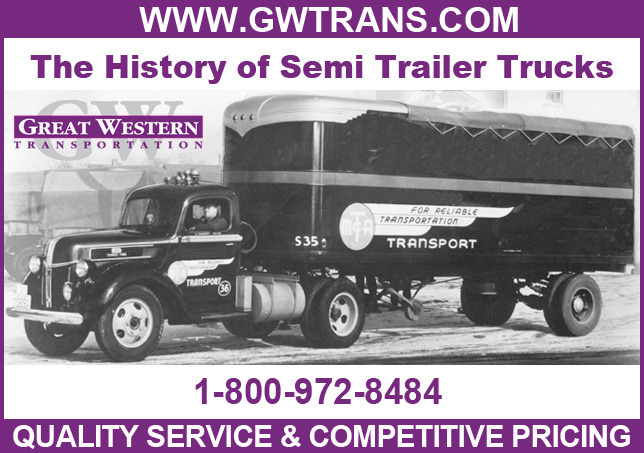 Great Western Transportation continues on in the semi-trailer trucking tradition by providing a wide variety of flatbed trucking services. The various types of flatbeds include: standard flatbed, drop deck, double drop deck, RGN (removable gooseneck), multi axle specialized trailers. 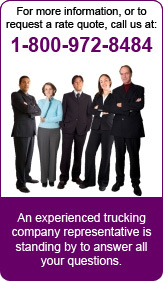 We can assist you in all your heavy haul trucking and flatbed trucking requirements.